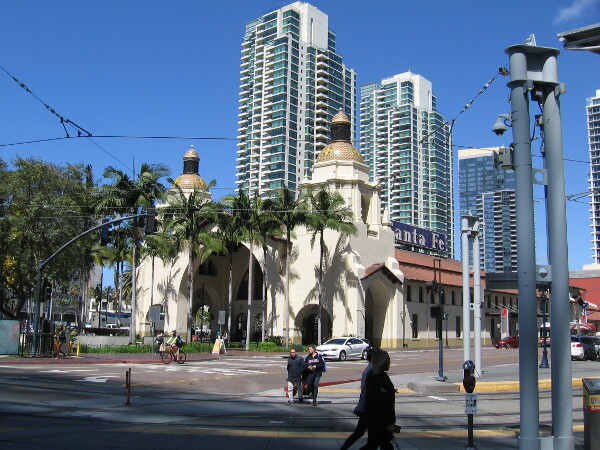 santa fe depot – Cool San Diego Sights! 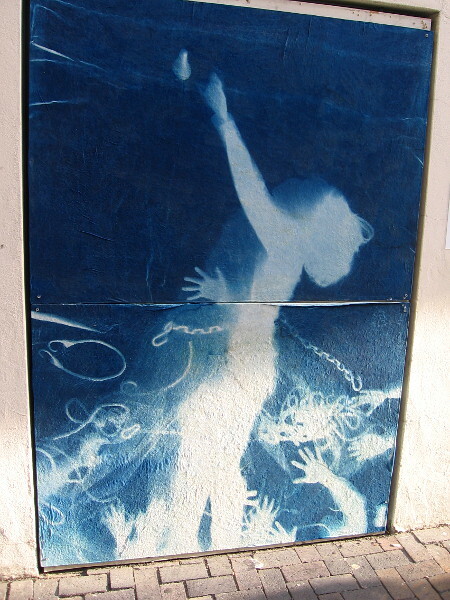 Student voices visualized in public art. 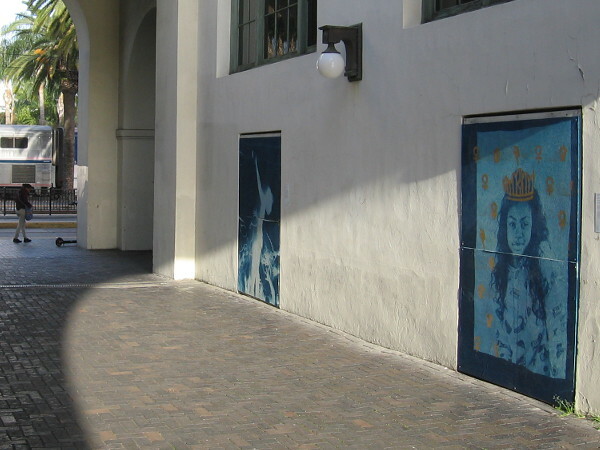 The voices of local high school students can now be “heard” in the breezeway between the Santa Fe Depot and the Museum of Contemporary Art San Diego. 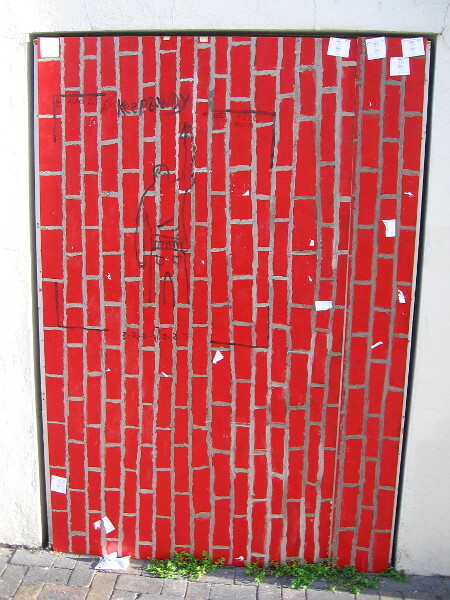 The artwork represents what youth in San Diego observe and are taught. The emphasis is on power. I was glad to observe one young person is thirsty for knowledge. Rènn (Queen), 2019, Xeviah Jordan. Mount Miguel High School. 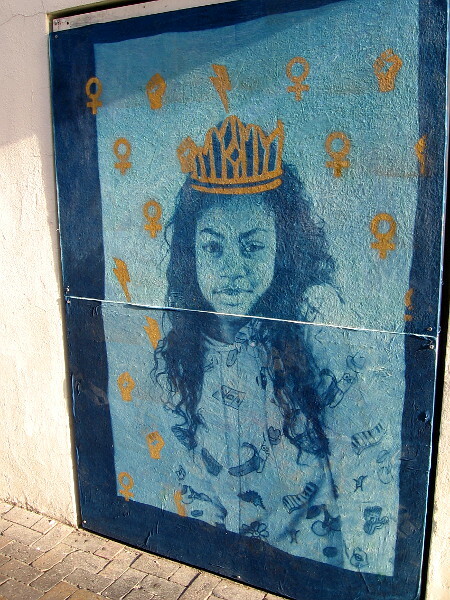 This work is about women’s empowerment. It shows how women can be dominant and on top. Observe and Procure, 2019, Eric Gallegos, Jose Jimenez, Marc Robledo. High Tech High North County. Our artwork is a wall and it represents how everyone is being watched by someone or something. Reach, 2019, Vanessa Townsend. 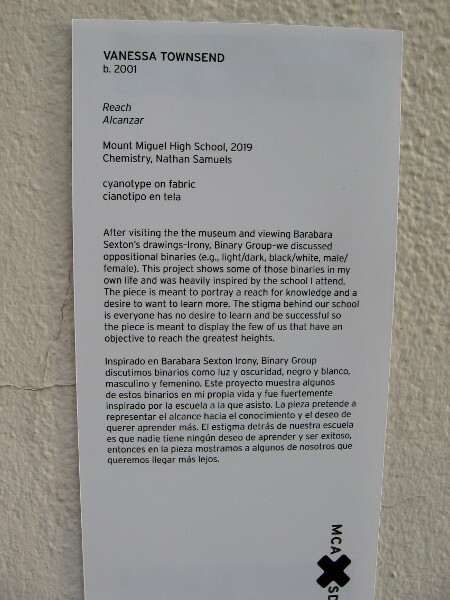 Mount Miguel High School. This piece is meant to portray a reach for knowledge and a desire to want to learn more. 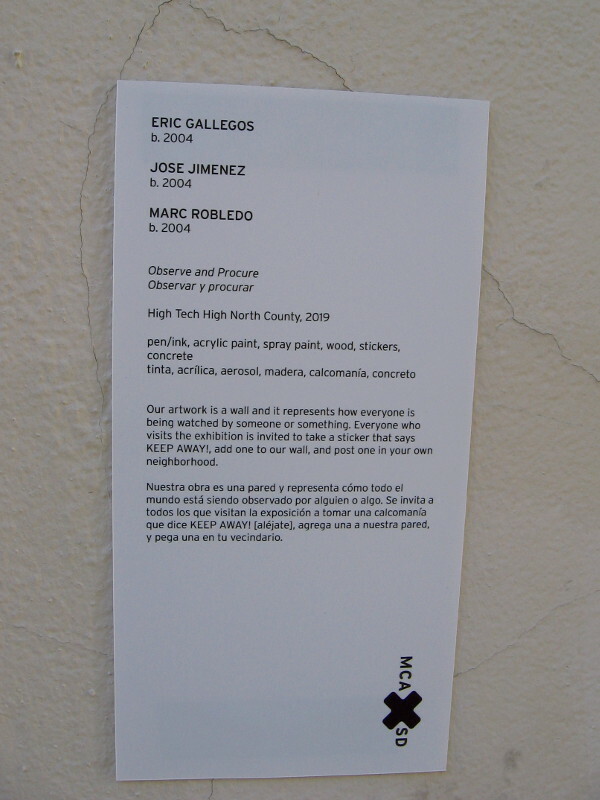 Posted on March 30, 2019 Tags art, creativity, education, high school, ideas, museums, people, photography, public art, san diego, santa fe depot, schools, students, womenLeave a comment on Student voices visualized in public art. 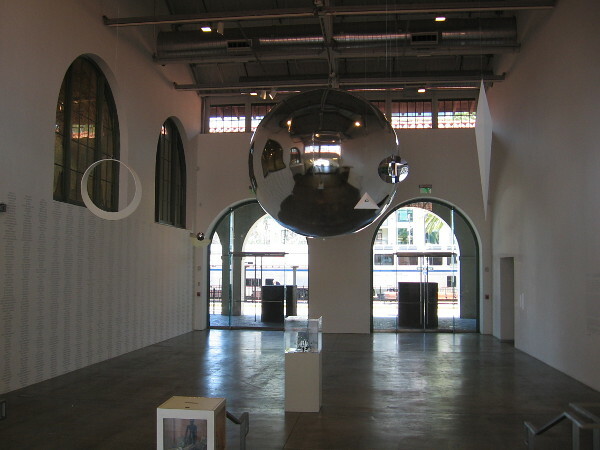 Baggage, a silvery orb, and contemporary art. 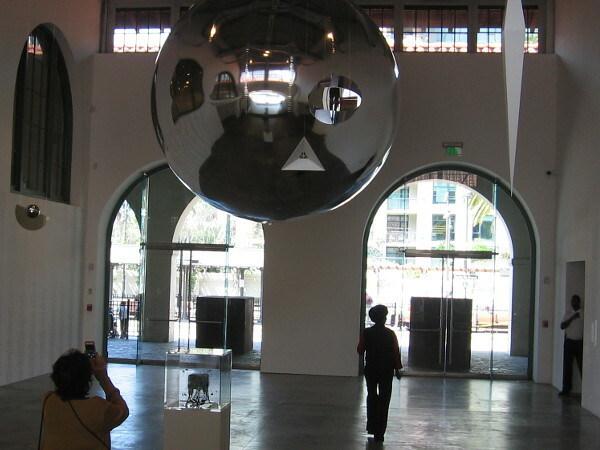 A large silvery orb is suspended from the ceiling of the Iris and Matthew Strauss Gallery, inside MCASD’s historic Joan and Irwin Jacobs Building. 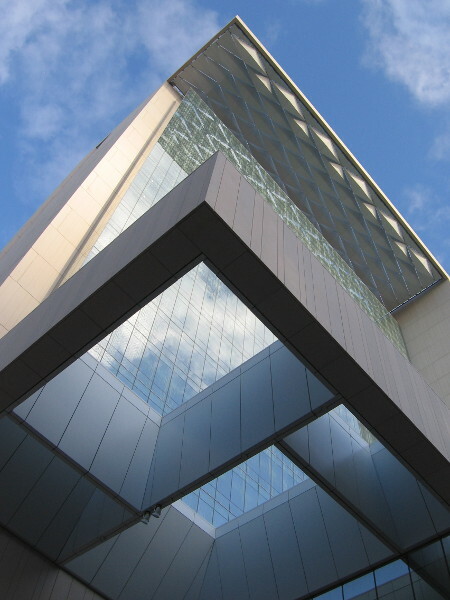 On Sunday I headed to the Museum of Contemporary Art San Diego to enjoy a tour of their downtown Joan and Irwin Jacobs Building. 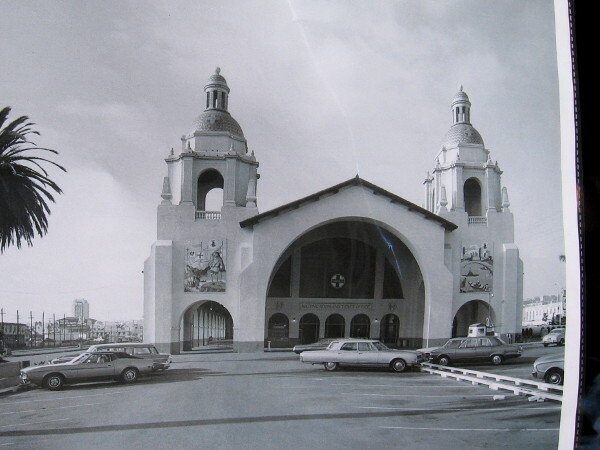 This historic building was one of many fascinating sites that the public could explore during the San Diego Architectural Foundation’s 2019 OPEN HOUSE SAN DIEGO. When it was time for the architectural tour to begin, our small group gathered near the museum’s entrance and we learned a little about the very unique Joan and Irwin Jacobs Building. 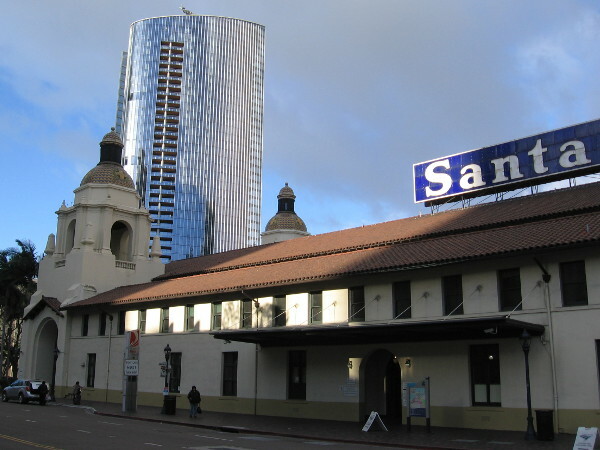 The building at first glance appears to be an extension of the Santa Fe Depot, San Diego’s downtown train station. 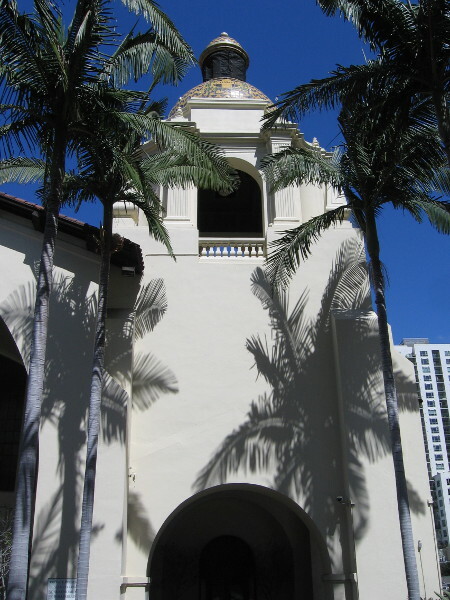 In fact, what is now called the Joan and Irwin Jacobs Building used to be the baggage building of the depot, and is separated from the train station’s passenger waiting room by an arched outdoor breezeway. 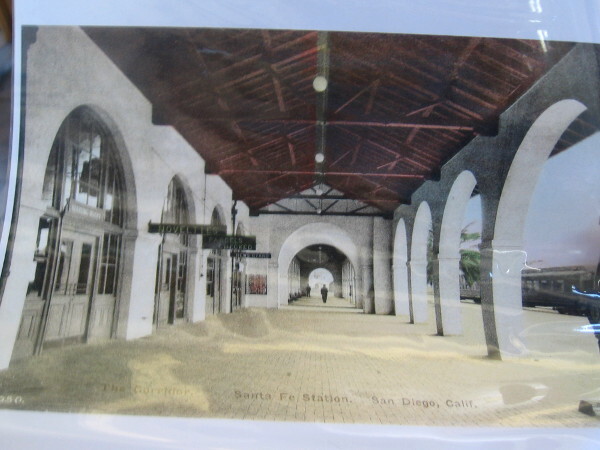 The Santa Fe Depot, which is now a transit center that also serves Amtrak, was built in 1915 by Bakewell & Brown to accommodate travelers coming to San Diego for the Panama-California Exposition held in Balboa Park. As decades passed, and travel by train waned, much less space was required at the station for baggage. Because of its historical importance, the huge old baggage building couldn’t be torn down or substantially altered. The enormous interior space, large beautiful windows and high ceilings were perfect for a unique downtown art gallery. 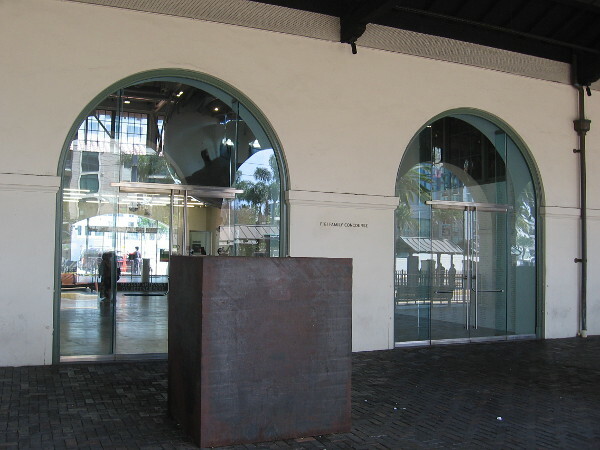 In 2007, the structure was converted by Gluckman Mayner Architects into an extraordinary downtown space for the Museum of Contemporary Art San Diego. 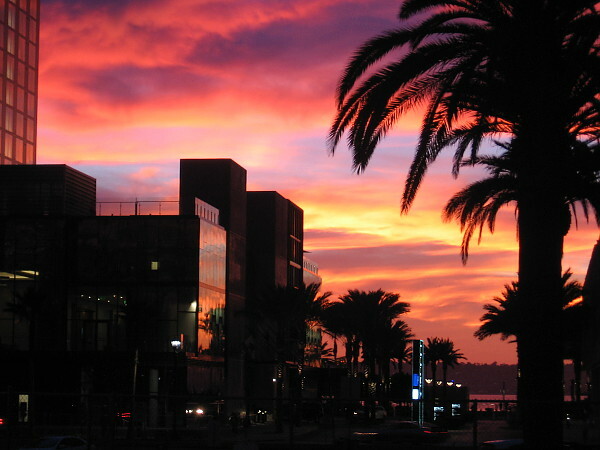 The downtown MCASD usually features more experimental art than their La Jolla location, so the unusually large galleries can be put to good use. 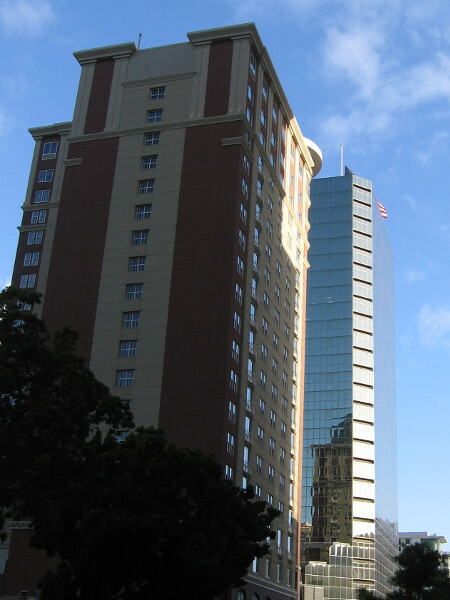 I learned that past exhibitions have included some monumental artwork, even a full-size translucent polyester fabric and stainless steel “New York” apartment, complete with major appliances! 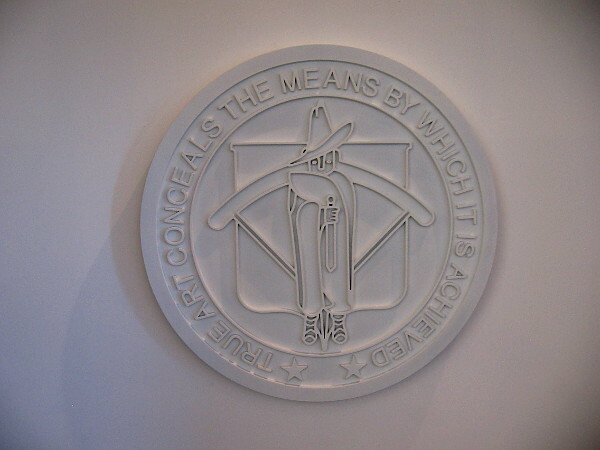 To explore art inside the Joan and Irwin Jacobs Building is a remarkable experience. It’s like moving through a vast inner world where small dreams become large. Just as a museum should be! Looking west across Kettner Boulevard at the Santa Fe Depot. 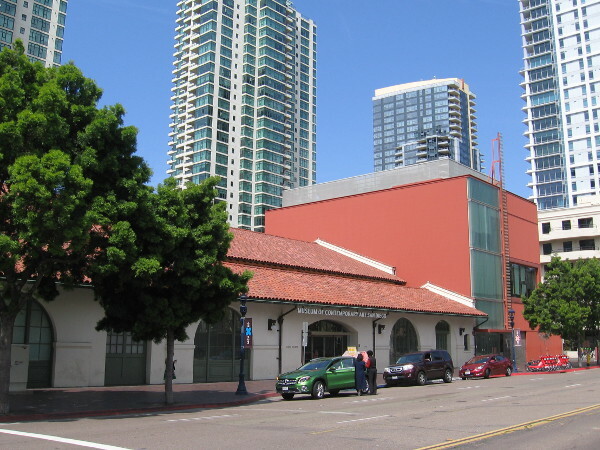 The old baggage building on the north side of the train station is now used by the Museum of Contemporary Art San Diego. 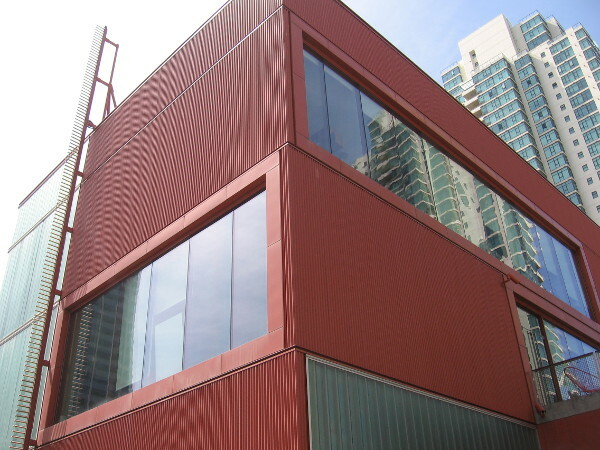 At the north end of the historic Joan and Irwin Jacobs Building is the modern three-story David C. Copley Building. In the past the David C. Copley Building has provided additional gallery space. 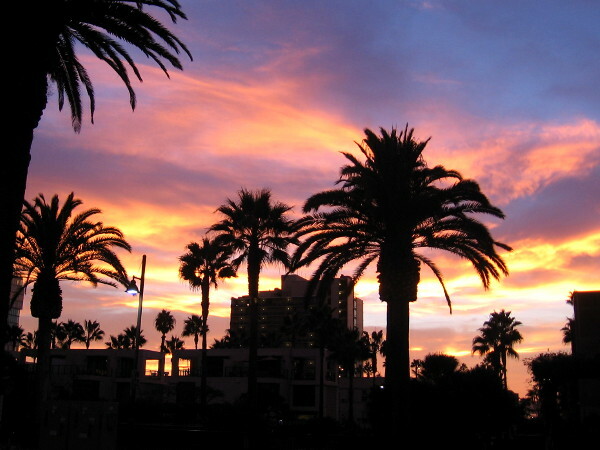 It now houses administrative offices for MCASD while their La Jolla location is renovated and enlarged. 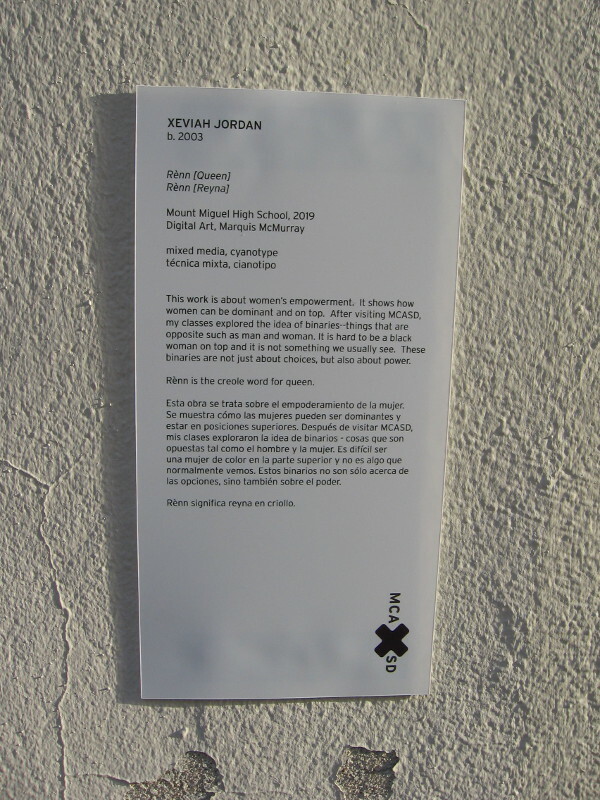 Sign in front of MCASD’s entrance invites passersby to come in and gaze at the orb. 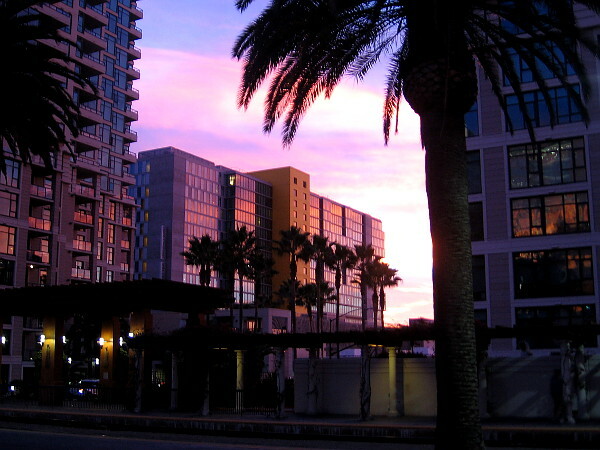 Looking from inside the museum across Kettner Boulevard toward the America Plaza trolley station. 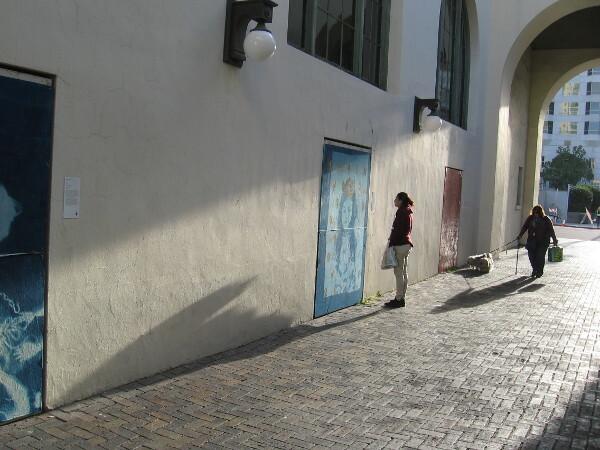 The two-story building seen to the right is MCASD’s original downtown location, now used by the museum for educational programs. As visitors enter the museum, massive artwork inside the Iris and Matthew Strauss Gallery immediately catches the eye. 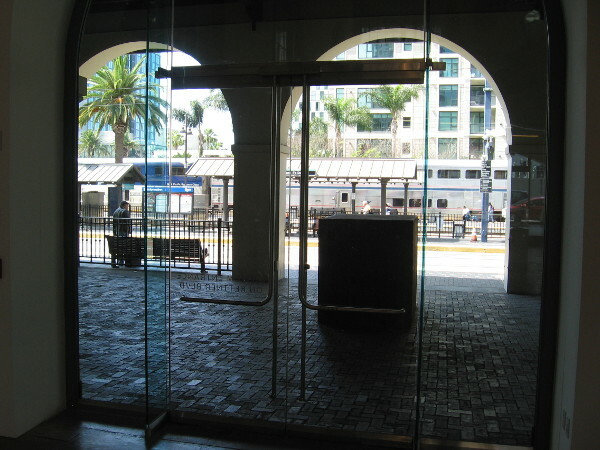 Looking west out glass doors at the Figi Family Concourse, and trolley and train platforms at downtown’s Santa Fe Depot. One of several large steel cubes outside the Joan and Irwin Jacobs Building, by artist Richard Serra, 2005. 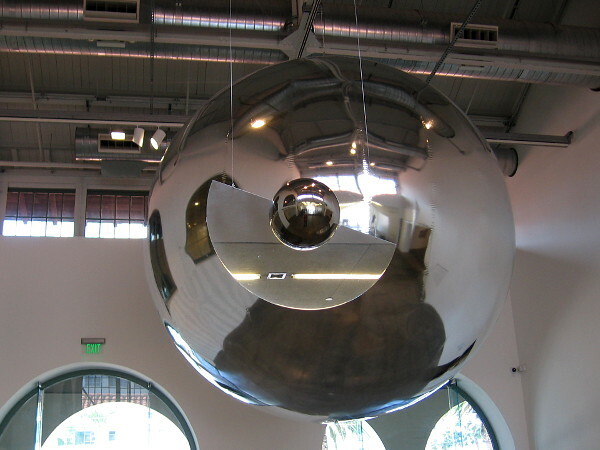 Prototype for a Nonfunctional Satellite, by contemporary artist Trevor Paglen. 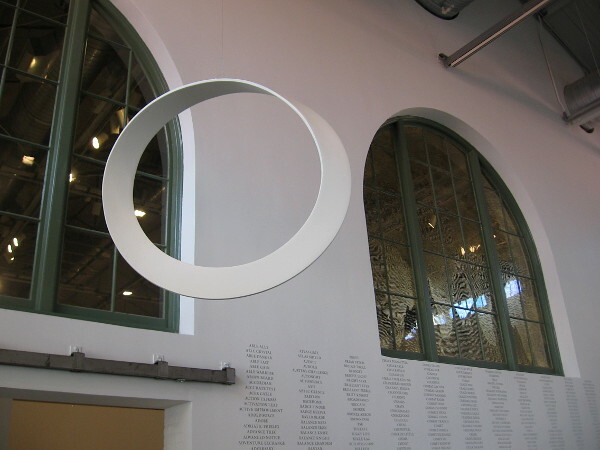 More artwork by the large arching windows of the old baggage building. This interior wall is part of MCASD’s unique Iris and Matthew Strauss Gallery. 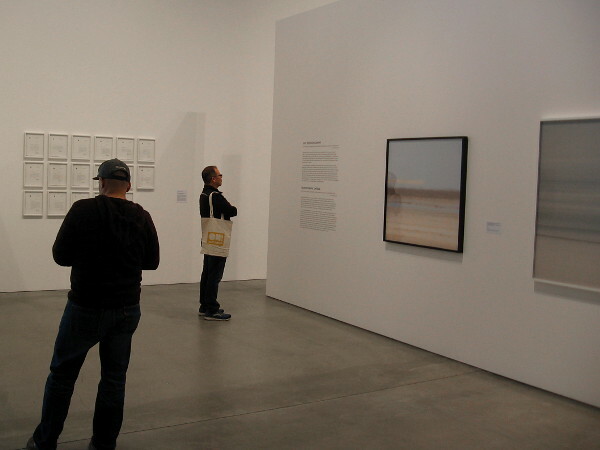 Visitors to the downtown Museum of Contemporary Art San Diego view photographs and other pieces by Trevor Paglen. 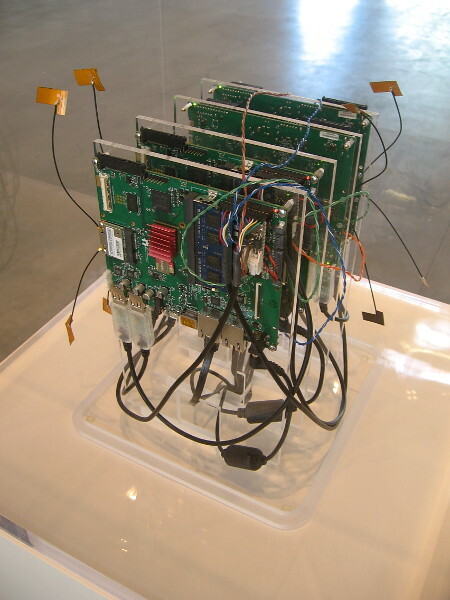 Autonomy Cube, 2015, Trevor Paglen. Working hardware that allows users to connect anonymously to the internet, by routing Wi-Fi traffic through the Tor network. True Art … (CIA Special Activities Staff), 2016, Trevor Paglen. High temp epoxy. 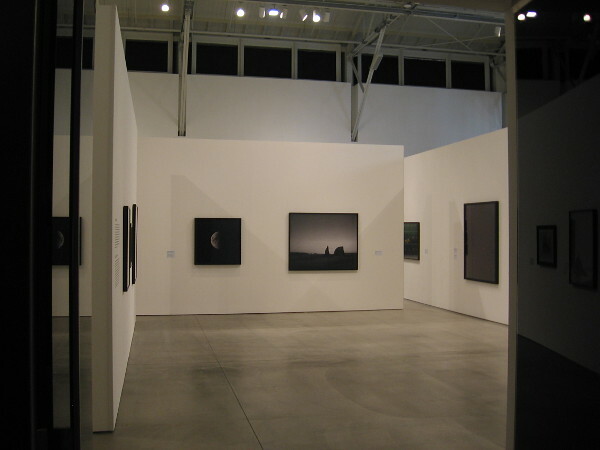 A look into a spacious gallery inside MCASD’s Joan and Irwin Jacobs Building. 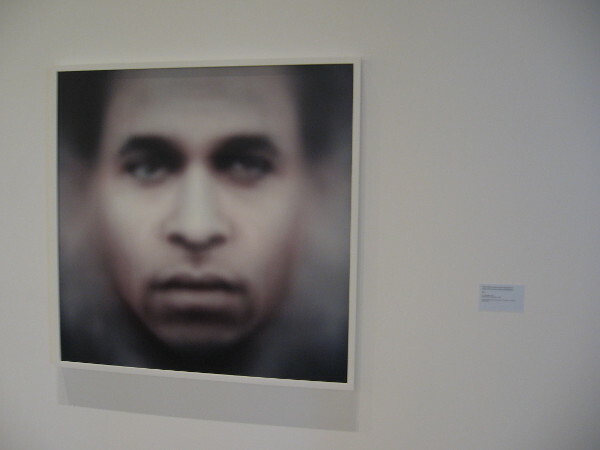 “Fanon” (Even the Dead Are Not Safe) Eigenface, 2017, Trevor Paglen. Dye sublimation print. 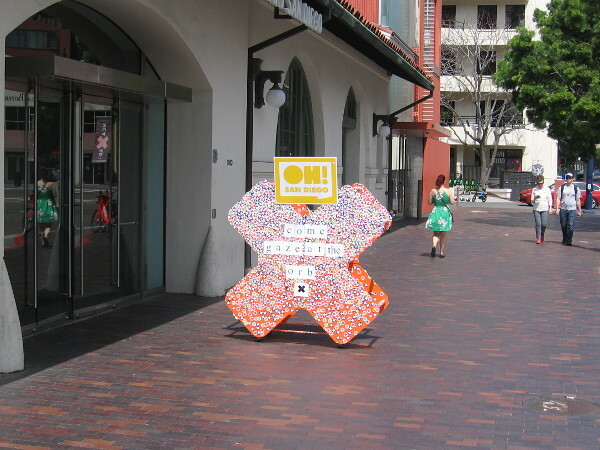 Astonishing sights await curious eyes at downtown’s Museum of Contemporary Art San Diego! 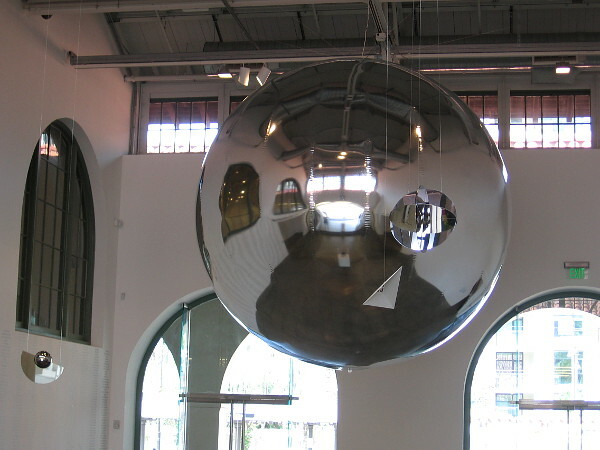 Posted on March 25, 2019 March 26, 2019 Tags architecture, art, artists, buildings, downtown, history, modern art, museums, photography, san diego, santa fe depot, technology, tourism, travelLeave a comment on Baggage, a silvery orb, and contemporary art. A small bird, and humor’s saving grace. This morning I published another short story. This one is titled The Station Sparrow. The humorous little tale was inspired by my own life experience. I often see birds inside the enormous passenger waiting room of Santa Fe Depot, the train station in downtown San Diego. 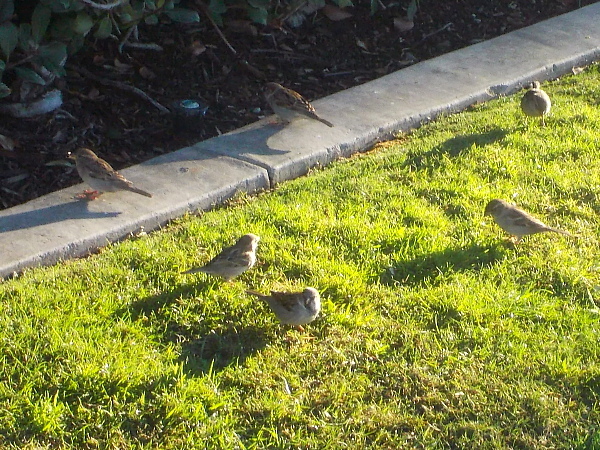 Feathered infiltrators come through the wide open doors and walk about the floor pecking at crumbs. That got me to thinking. And imagining. And laughing. The Station Sparrow is mostly about life, and humor’s saving grace. Click the link to read it. I hope it makes you laugh, too. Posted on November 18, 2018 November 19, 2018 Tags authors, birds, fiction, funny, humor, imagination, laughter, life, publishing, reading, santa fe depot, short stories, writers, writingLeave a comment on A small bird, and humor’s saving grace. 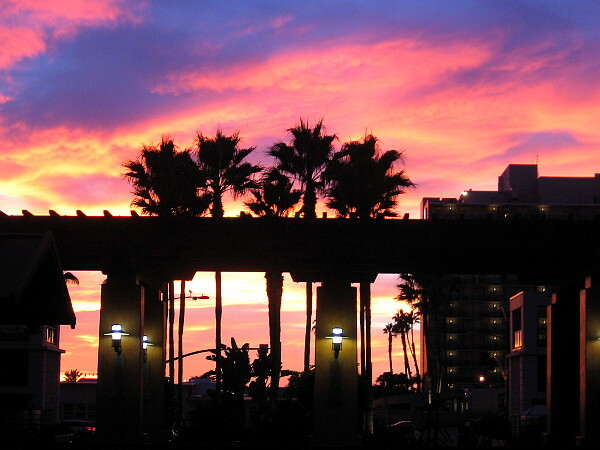 Glorious sunset seen from Santa Fe Depot! The sunset this evening was absolutely glorious. I was walking along the long train platform of San Diego’s downtown Santa Fe Depot when the clouds began to really blaze. Fantastic light reflected from the windows of nearby high-rise condos and several hotels to the west. 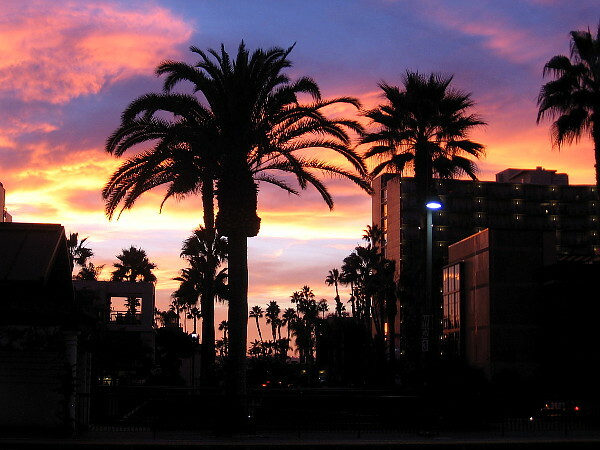 As night fell, dramatic color crowned dark palm trees. 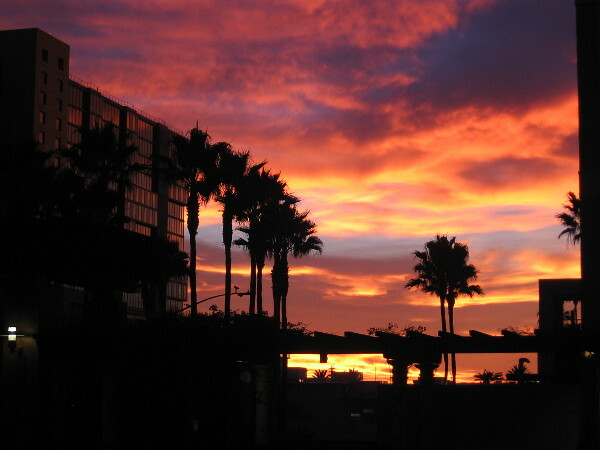 Posted on November 1, 2018 Tags buildings, clouds, color, evening, light, night, palm trees, photography, reflections, san diego, santa fe depot, sunset, walking, windows2 Comments on Glorious sunset seen from Santa Fe Depot! San Diego landmarks, mysterious in the fog! 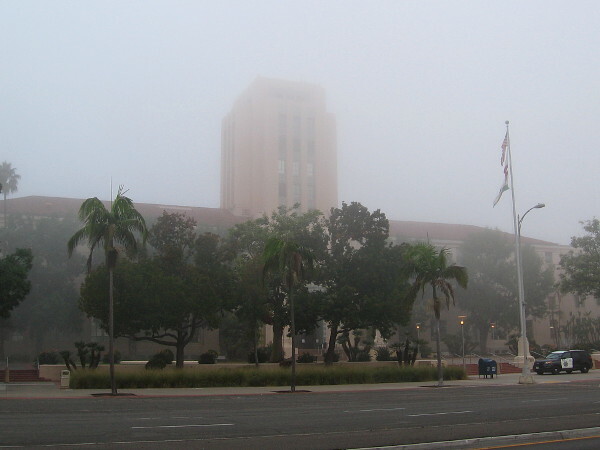 San Diego’s handsome County Administration Building in the fog. 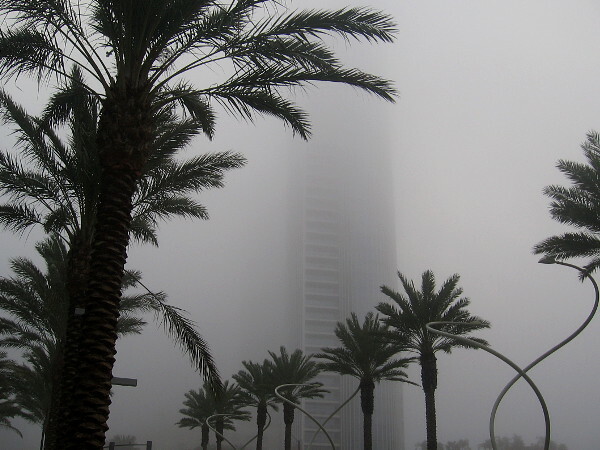 Early this morning an unusually heavy fog rolled into San Diego. I love the dreamy quality of fog, so I took a long, quiet stroll around downtown before catching a trolley for work. I floated around the County Administration Building, turned south when I reached the foggy bay, then steered east when I reached Broadway. Finally I ended up at Santa Fe Depot. 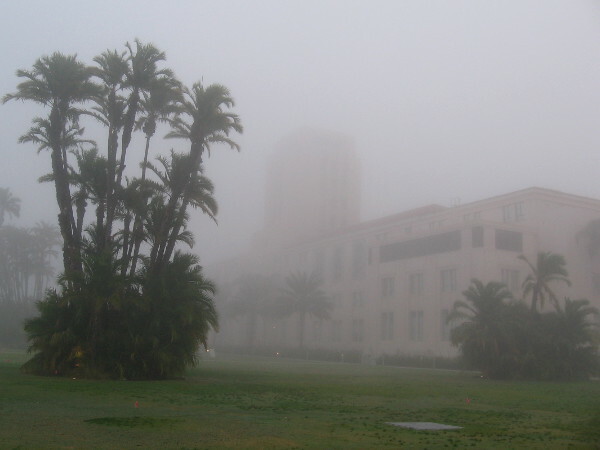 Please enjoy these photos of several San Diego landmarks engulfed by the gray, mysterious fog! 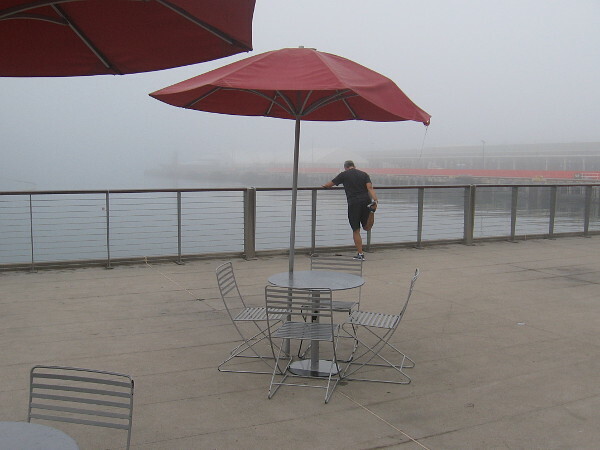 Mysterious photograph of foggy Waterfront Park and the County Administration Building. 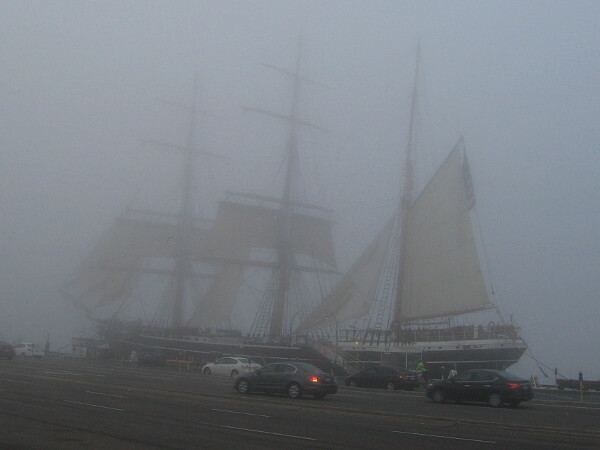 The historic tall ship Star of India appears through a heavy fog on San Diego’s Embarcadero. 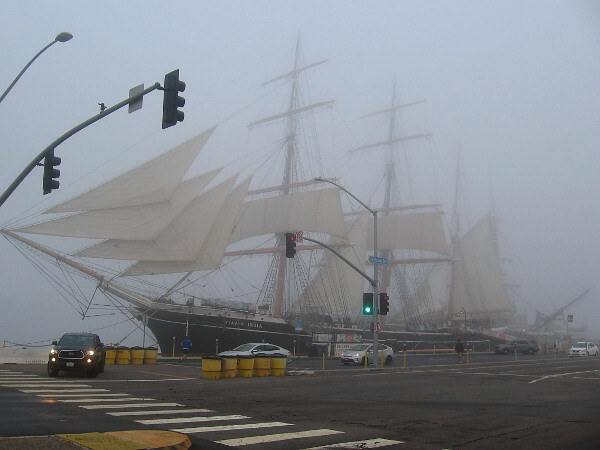 The beautiful Star of India appears to cut through a fog that conceals San Diego Bay. A jogger stretches on the observation platform near Broadway Pier, beside the fog covered water. 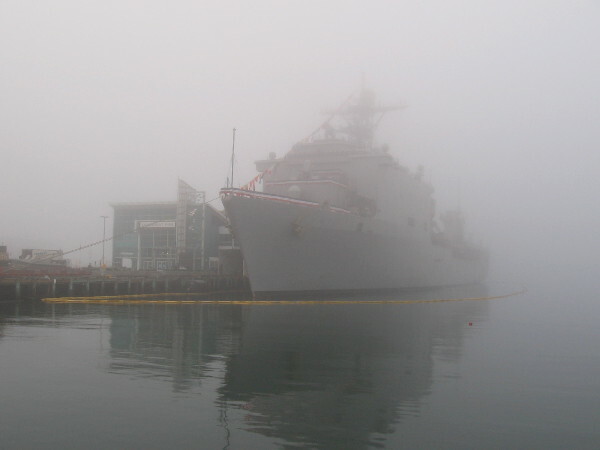 United States Navy ship USS Harpers Ferry (LSD-49) docked in the fog at Broadway Pier, awaiting public tours during Fleet Week this weekend. 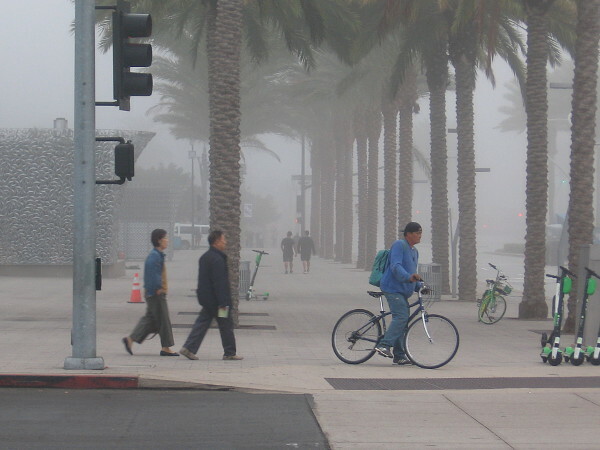 People head down a San Diego sidewalk in early morning fog. The tall Pacific Gate building rises through the deep gray fog. The historic Santa Fe Depot in the morning fog, seen from the west. Trolley tracks lead through a fog past Santa Fe Depot in San Diego. 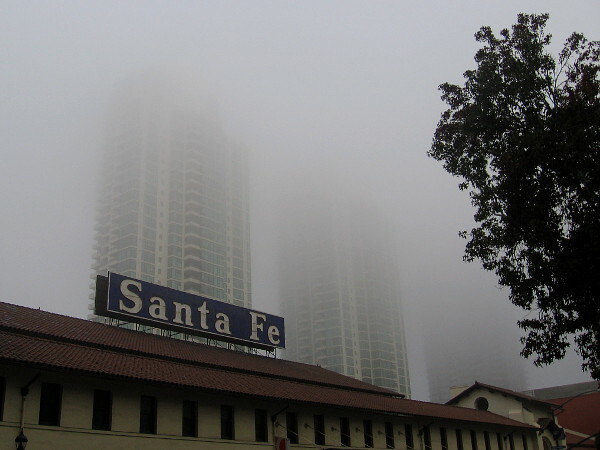 The old train station’s Santa Fe sign stands out when contrasted with fog engulfed high-rises. Posted on October 26, 2018 October 26, 2018 Tags broadway pier, buildings, downtown, embarcadero, fog, landmarks, morning, mysterious, photography, san diego, santa fe depot, ships, star of india, walking7 Comments on San Diego landmarks, mysterious in the fog! Walking from Civic Center Plaza to Santa Fe Depot. 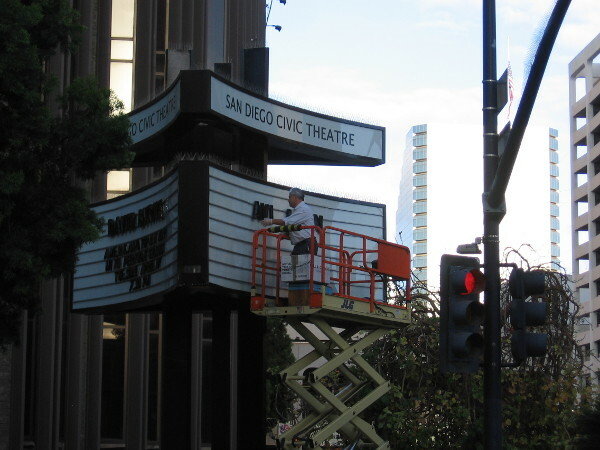 As I approached Civic Center Plaza along B Street, I watched someone changing the sign at the San Diego Civic Theatre. Just a quick blog post. These photos are from my morning walk downtown. I didn’t pull my camera out until I spied that guy above changing the San Diego Civic Theatre sign. After steering my feet through Civic Center Plaza, I proceeded west along C Street. 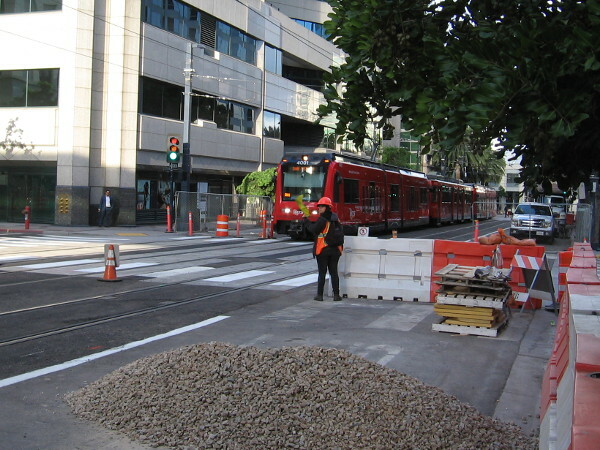 Over the past few months, I’ve been observing the construction of a new Courthouse trolley station on C Street. Beginning April 29, 2018, it will be the final stop of westbound Orange Line trolleys. Until further notice the Blue Line will still terminate at America Plaza. 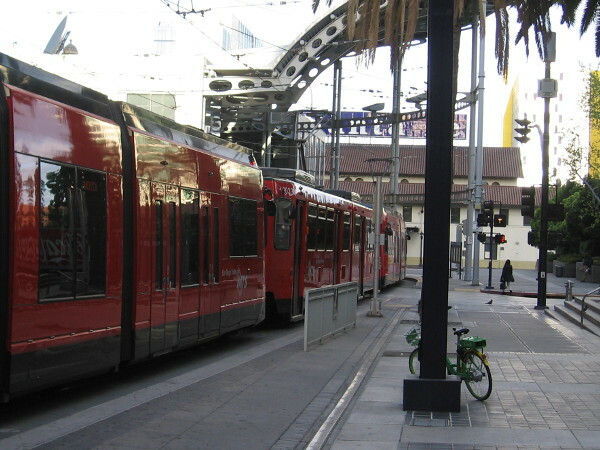 Once the San Diego Trolley’s extension up to La Jolla is complete, I believe the Blue Line (and possibly the Green Line) will be reconfigured. 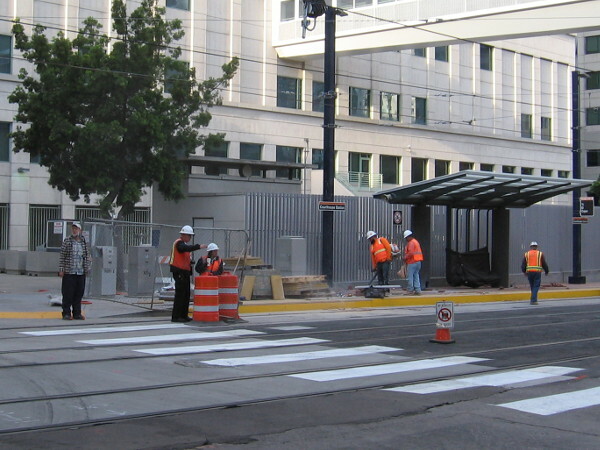 Workers prepare the new Courthouse trolley station on C Street. Starting April 29, 2018, the Orange Line will terminate here. As I proceeded west on C Street, I turned my camera skyward for a shot of the fascinating new San Diego Central Courthouse. Here comes an eastbound trolley, approaching the new Courthouse station that is presently under construction. Buildings to the north catch early morning light. I’m passed by a westbound Blue Line trolley as it enters America Plaza. A morning delivery and more sunlight on buildings. These days one can see a whole lot of construction throughout downtown. 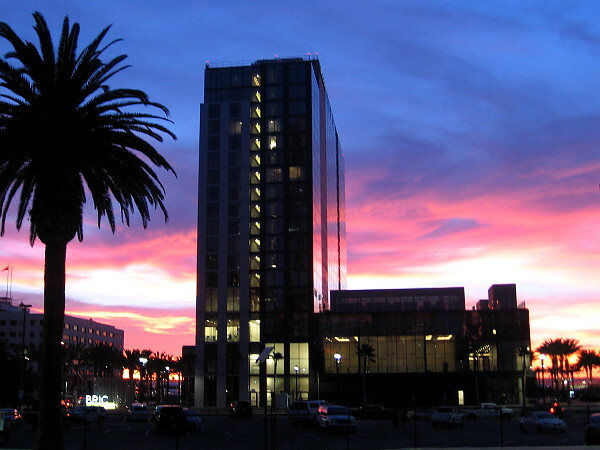 I’m nearing the Santa Fe Depot, which stands across Kettner Boulevard from America Plaza. Increasing clouds would produce rain a few hours later. Almost to Santa Fe Depot, where I’ll catch a Green Line trolley for work on the other side! 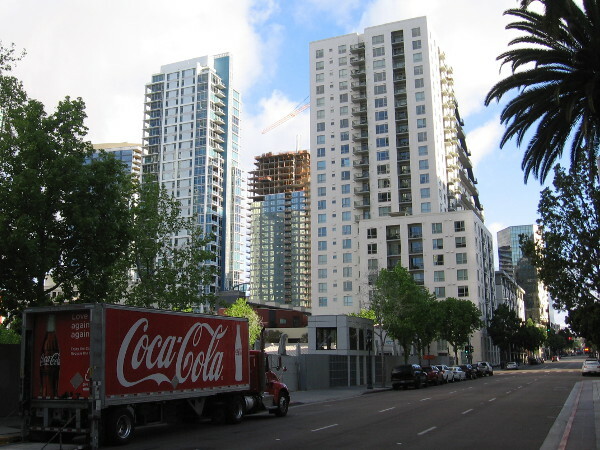 Posted on April 19, 2018 April 19, 2018 Tags buildings, civic center, construction, downtown, light, morning, photography, san diego, san diego trolley, santa fe depot, streets, transportation, trolley station, walkingLeave a comment on Walking from Civic Center Plaza to Santa Fe Depot. 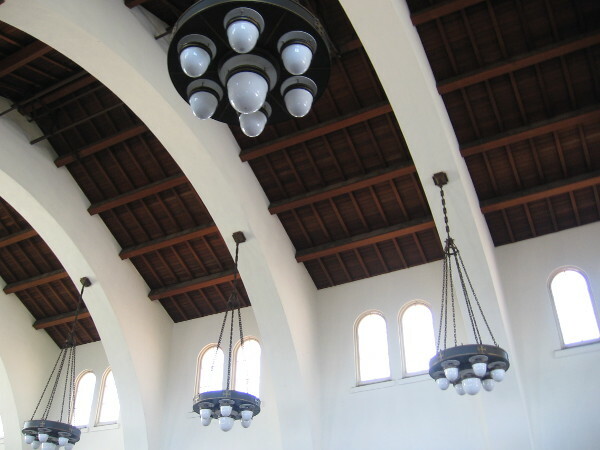 A short architectural tour of the Santa Fe Depot. 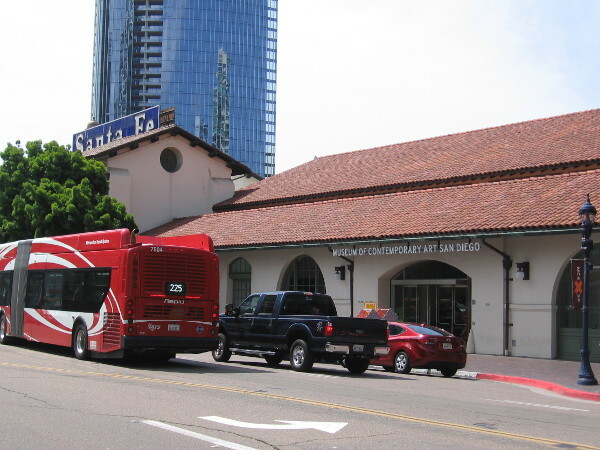 Photo of Santa Fe Depot as it appears today. Some changes to the historic building are possibly in its future. I went on a short tour of the Santa Fe Depot last week during the San Diego Architectural Foundation 2018 OPEN HOUSE event. I’ve posted about the depot several times in the past. One fact-filled post concerned an historical exhibit inside the waiting room; another shared hundred year old photos of the building. During our tour I learned even more and enjoyed looking at additional old images. 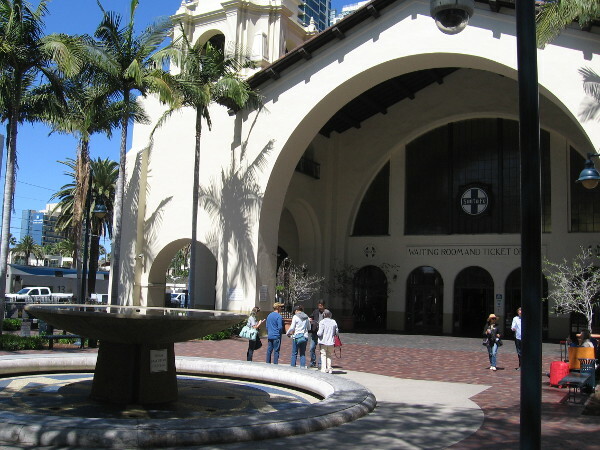 This downtown San Diego landmark was designed by Bakewell and Brown to welcome the many anticipated visitors to the 1915 Panama-California Exposition in Balboa Park. The depot’s construction began on May 28, 1914. The building officially opened on March 7, 1915. Materials that were used include a steel frame with wood trusses, concrete slabs, brick arcades and hollow clay tile infill walls. The architects Bakewell and Brown also designed San Francisco City Hall, the Coit Tower and Pasadena City Hall. During the course of its history, there have been various changes to the building and its forecourt. 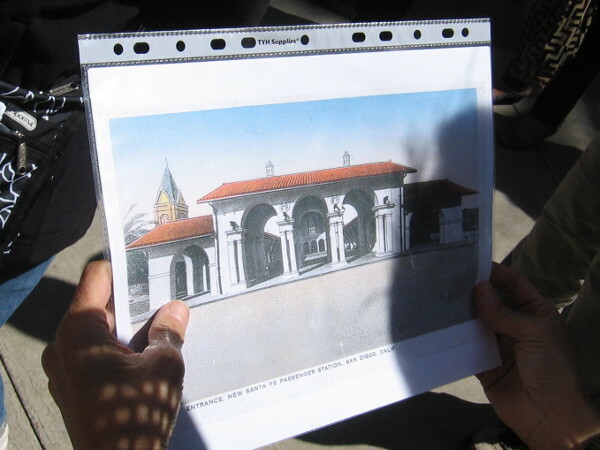 The original arched forecourt, pictured in some of the following photos, was demolished in 1954 to make way for a parking lot. 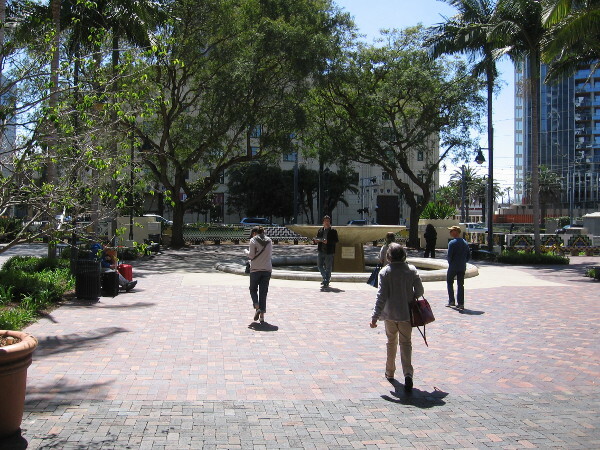 The current outdoor plaza featuring a fountain and colorful tiled benches replaced the parking lot in the 1980s. The gentleman providing the tour indicated that recent new ownership of the Santa Fe Depot has opened up the possibility of future development. 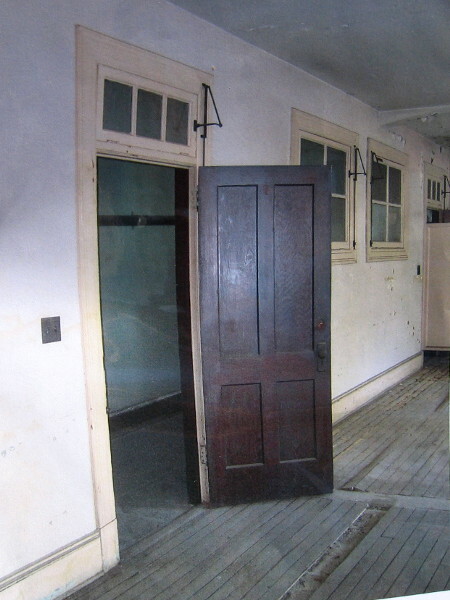 I learned an unused second story of the depot, once containing a manager’s apartment, telegraph room and railroad worker bedrooms, might be converted into office spaces, but an elevator, heating and electricity are now lacking. I learned that the fountain in the forecourt’s plaza is leaking and permanently turned off. This valuable property between the main depot building and Broadway might be developed into a space for downtown eateries. 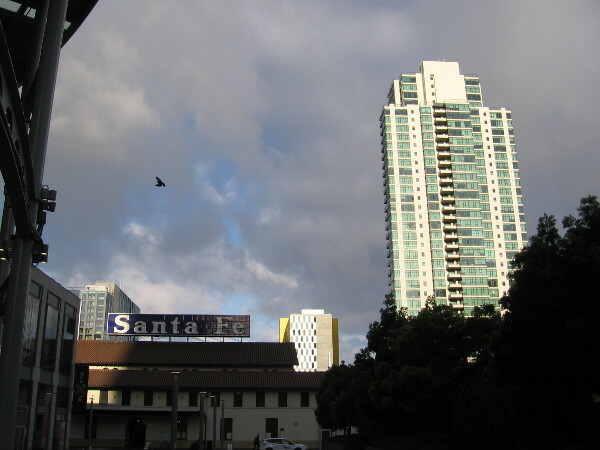 I also learned the large iconic Santa Fe sign atop the depot dates from the mid 50’s, and that there are plans to light it up at night using LED lighting. Read the captions for some additional fascinating facts about this architectural marvel! Looking up at one tile-domed tower. The black material is holding together cracked terracotta columns on chicken wire. 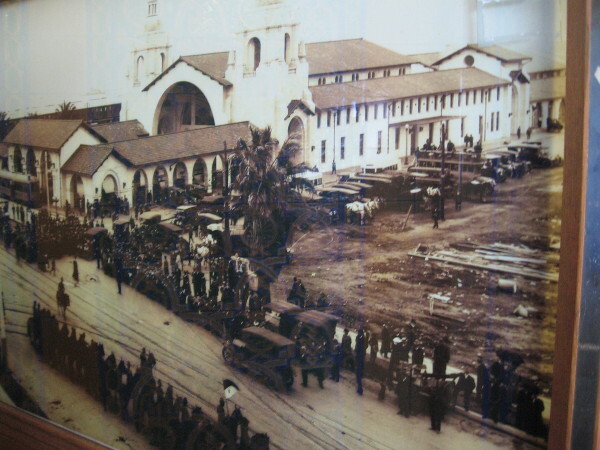 The 1915 depot was built for the Panama-California Exposition in Balboa Park. 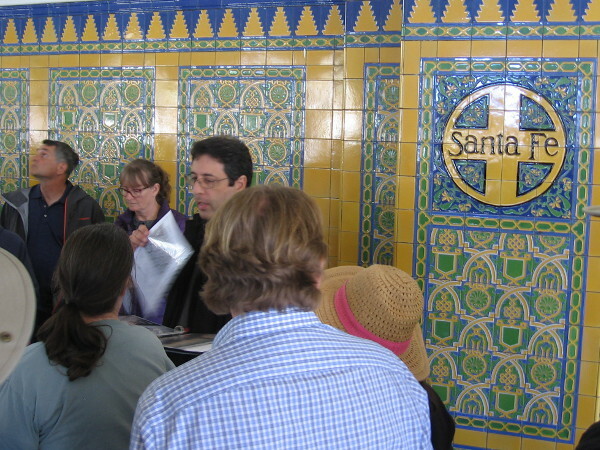 Our tour group and a few Amtrak passengers move through the Santa Fe Depot’s large waiting room. The building’s architecture is in the Mission Revival style with Spanish Colonial Revival influences. We learn about the beautiful tilework throughout the depot. 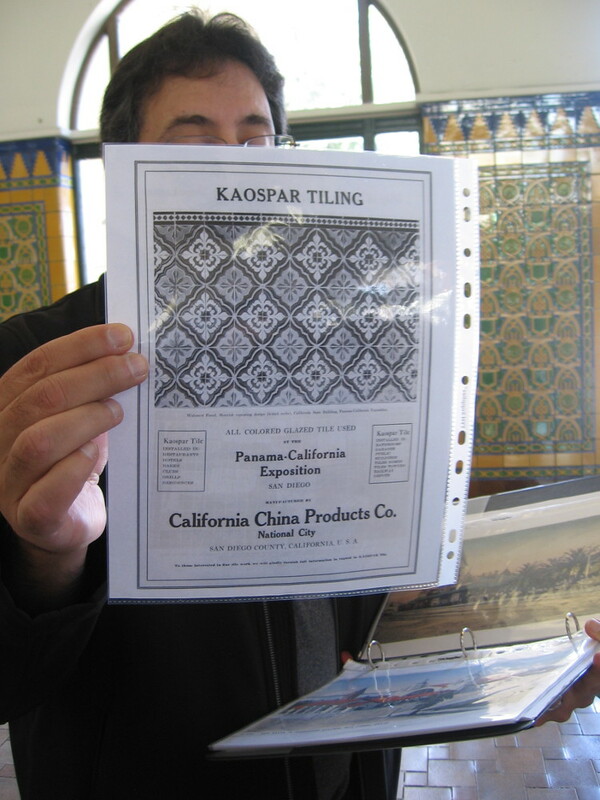 The depot’s glazed Kaospar tiling was created by California China Products Co. of National City, the same company that produced all of the tile for Balboa Park’s 1915 exposition. 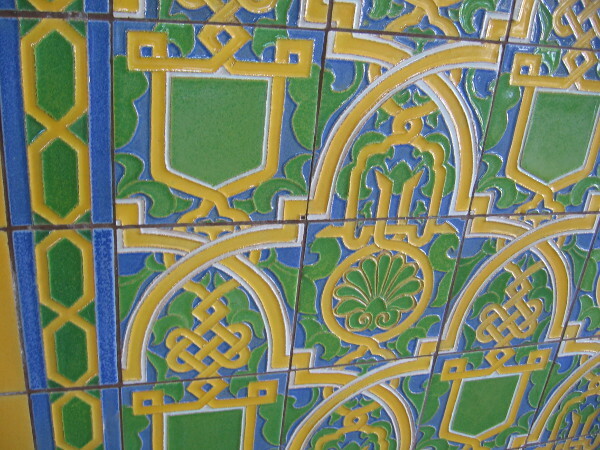 Raised levels of these gorgeous tiles each feature a different color! 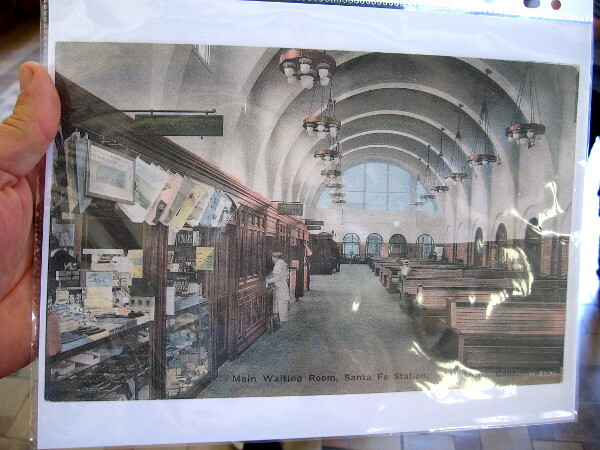 We’re shown an old postcard image of the original Main Waiting Room. 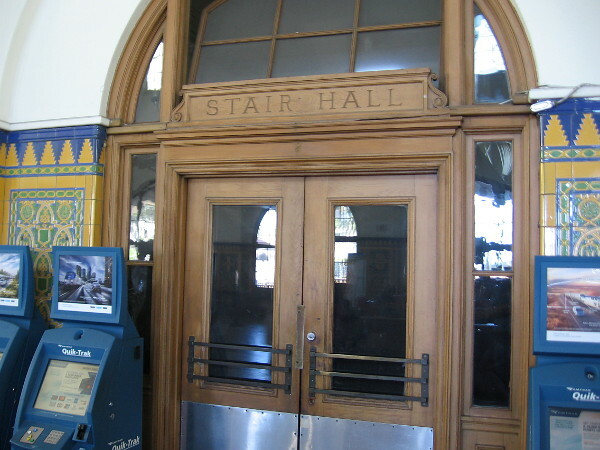 Ticket and vending kiosks lined the west side of the depot’s interior. There used to be a Fred Harvey lunch room near the current ticket area at the building’s north end. Looking up at the amazing ceiling. Most of the woodwork has never been painted. The original bronze light fixtures have an appearance that is masculine and sturdy. More handsome woodwork around a door that leads to an old Stair Hall on the waiting room’s east side. Our group heads outside to the forecourt’s sunny plaza. Looking at the south side of the depot. Sadly, the fountain leaks and is turned off. We are shown more old images. This is an illustration of the original arched forecourt structure on Broadway. I also see the tower of the original 1887 Victorian station to the west (the other side of the tracks) before it was demolished. 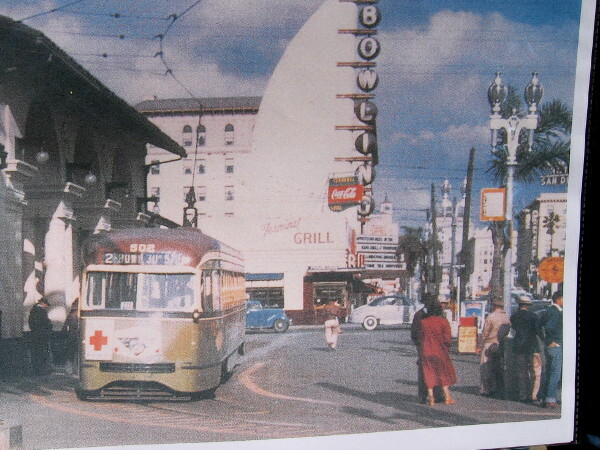 Streetcars used to run along Broadway right up to the old forecourt! A photo of the now unused second floor of the Santa Fe Depot. Another historical photo. 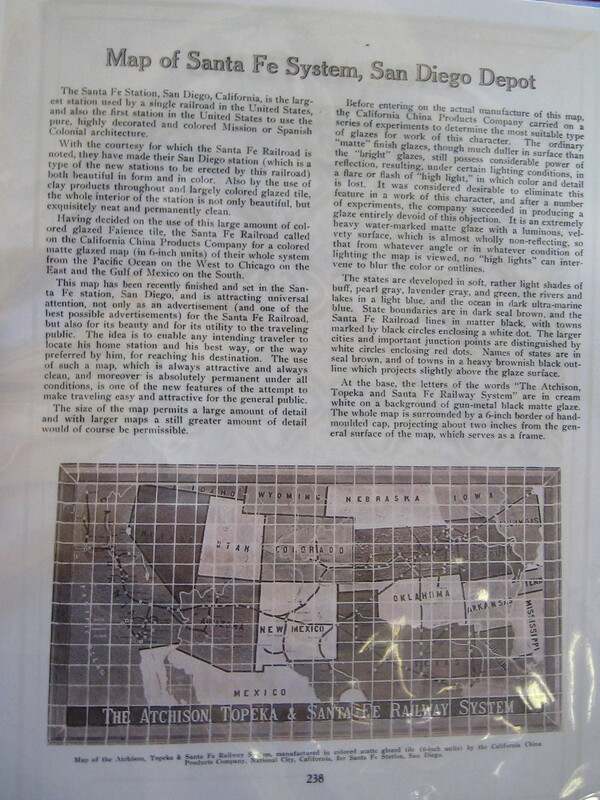 This can be found on one side of the information kiosk presently inside the depot. Our tour guide collects old postcards. Here’s another that shows the arched west side of the depot, beside the railroad tracks. 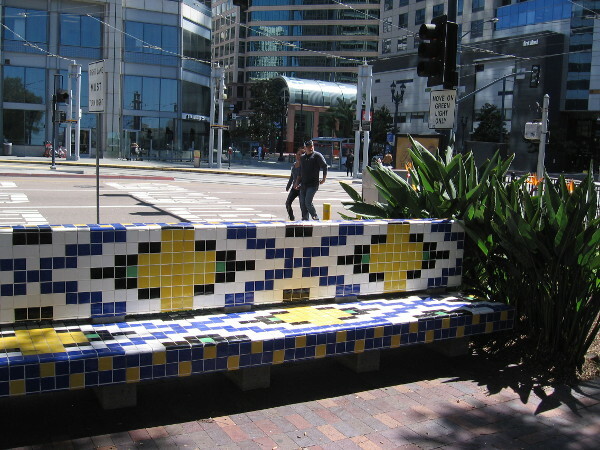 Gazing from the forecourt’s plaza over a tiled bench toward America Plaza and buildings along Broadway. This area might soon undergo changes! 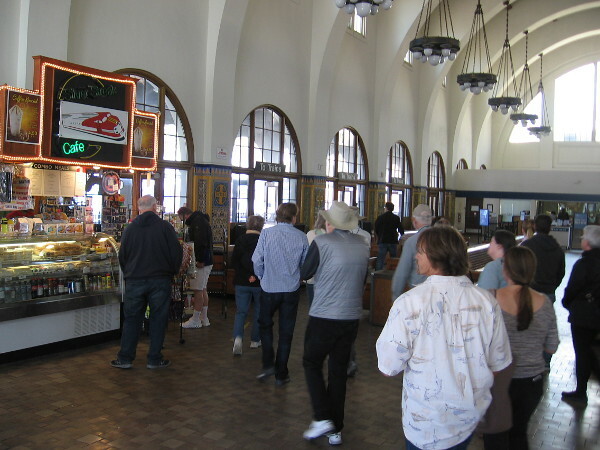 Posted on March 31, 2018 March 31, 2018 Tags architecture, art, beautiful, buildings, downtown, history, landmarks, photo, public art, san diego, santa fe depot, tour, trains, transportation2 Comments on A short architectural tour of the Santa Fe Depot.